You know how much I love panna cotta, but what you may not know is that I consider it my “go to” dessert for when I have little time, but still want to impress my guests. You do need to make it in advance, but it comes together in 15 to 20 minutes. It is also a very versatile dessert and you can come up with so many flavours and “looks”, so it is never boring. In fact, you can see a few of my favourite combinations here. 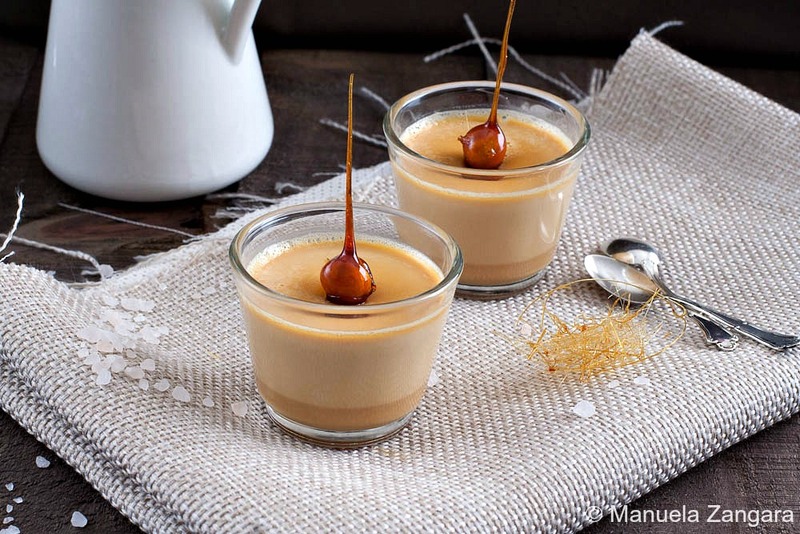 This time I will share with you one of my husband’s favourite variations: Salted Caramel Panna Cotta… and I will also show you how easy it is to make those nice caramel decorations to go with it! Enjoy! 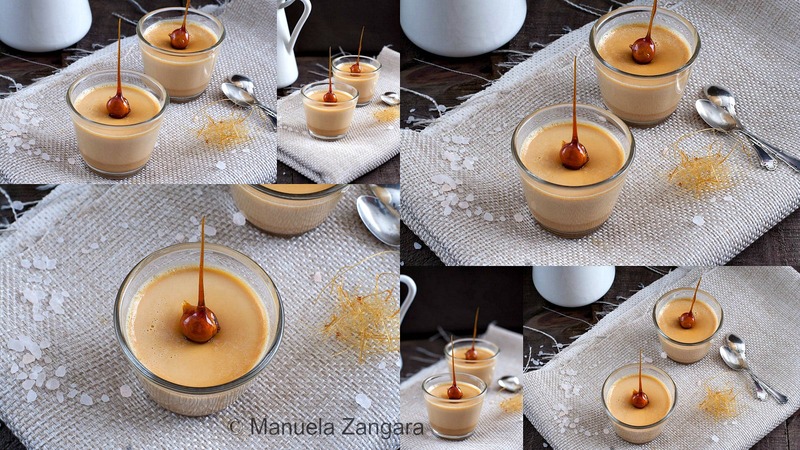 The recipe with step by step instructions on how to make the perfect Salted Caramel Panna Cotta. Put the cream, milk and vanilla extract into a mug and heat it in the microwave for 40 seconds. Put the sugar in a heavy bottomed saucepan and melt it on medium heat until it becomes a dark amber colour. 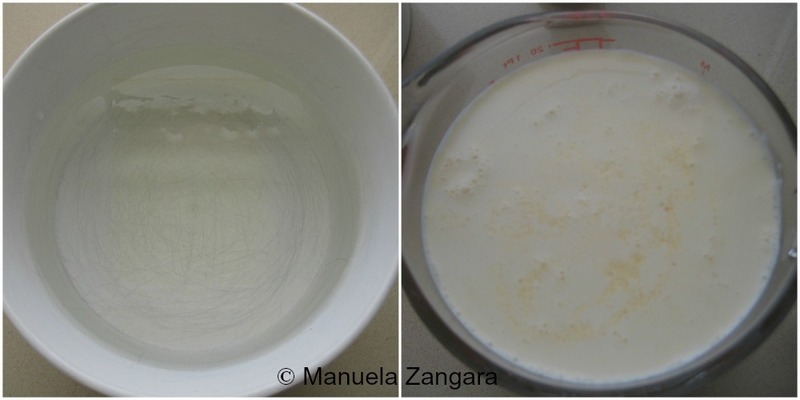 Do not stir, but if lumps start forming swirl the pan around. Carefully add the warm cream mixture stirring it into the caramel and keep it on the fire (it may solidify at this point, so keep stirring and the caramel will melt again). Add the sea salt and mix. 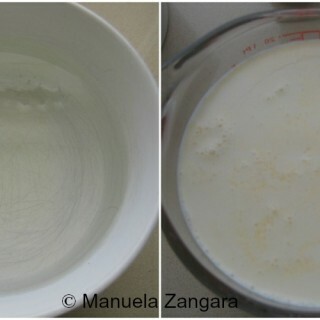 Squeeze the excess water from the gelatine sheets and add them to the hot caramel cream. Mix well until completely incorporated. Strain the mixture into glasses/moulds. Melt the sugar in the water over a medium fire and let it become a medium dark amber. Insert a toothpick in each hazelnut and dip them in the caramel, then keep them upside-down to drain the excess caramel, until it solidifies. I am a panna cotta freak and I also think it is the ideal dessert for company – easy to make AND make ahead! This is a stunning recipe and gorgeous! 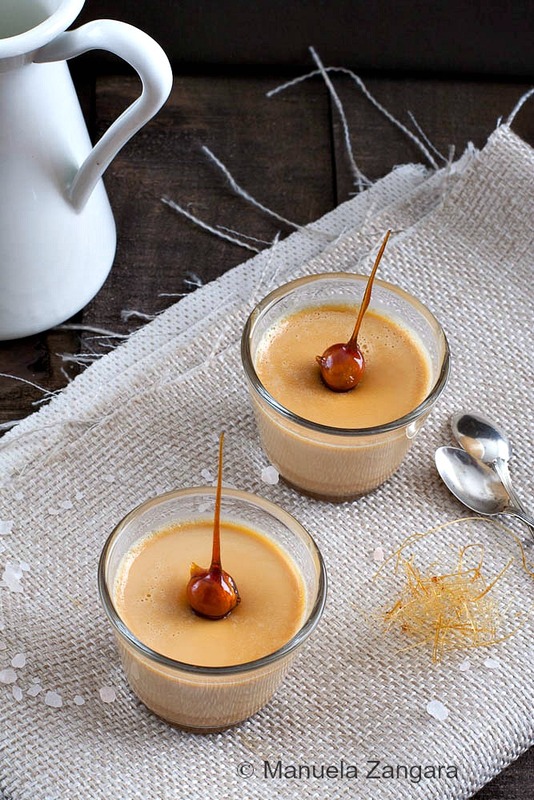 I adore panna cotta and consider caramel to be God’s gift to us. It’s absolutely amazing. Your dessert looks delicious and I love the caramel/hazelnut decorations on top. This looks great, but I have some questions about the caramel hazelnuts. Are you using a candy thermometer? Doesn’t the extra sauce drip onto the floor when they dry? How long do they take to harden? Hi there! I didn’t use a candy thermometer for the hazelnuts. You just want the caramel to become a golden amber colour and let it cool down just enough (a few seconds) so that you can get it to solidify while dripping. You can put some baking paper on the ground so you avoid caramel on it… that’s what I did. 😉 They do harden pretty fast though, so you need to work quickly. 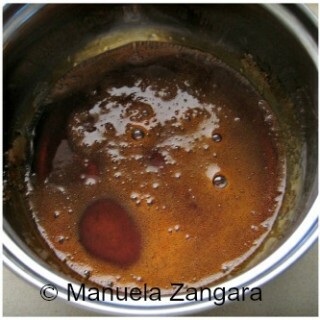 If the caramel becomes too cold you will need to re melt it on the fire for a few seconds. I love panna cotta too! I have not tried a salted caramel one yet. Yours look so delicious. And that hazelnut sugar piece just bring the whole presentation to another level. Amazing work! Oh YUM! You just combine one of my most favorite desserts with my most favorite dessert flavor!! This is a must make! And that caramelized hazelnut…wow! G’day and who could go past this great combination of flavors, true! Wish could come through the screen and try some now too! the instructions say you can use gelatin powder in place of gelatin sheets. If so, do you just sprinkle in the powder at the same point that you would mix in the moist sheets? Please clarify – this looks delicious! The process is slightly different… My friend Mareena made my chocolate panna cotta with powder gelatine. You can see her post here: http://mareenasrecipecollections.com/2012/10/19/chocolate-panna-cotta/ It is the same process with any flavour panna cotta. Hope it helps! I’m considering making these, but I would like to make them vegetarian friendly for some friends that would appreciate it. Do you have any suggestions for using a vegetarian alternative to gelatin, such as agar-agar (or something else) ? I will definitely let you know how it turns out! I have to go shopping for the agar agar, but I want to try it out soon so I can bring it to our next get-together. Hello, Would love to make this gorgeous panna cotta with gelatine sheets. Could you please tell me what strength do you use….gold or titanium? Its looks so yummy! Can i use whipping thickened cream ?